To sledge in the Swiss Alps is not to sled. Repeat, it is not to sled. Sledding is a neon inflatable inner tube. Sledding is a barely snow-covered hill on a golf course. Sledding is trying to have a fun ride down a slope, but turning into an immediate danger to three-foot-tall beings who are seemingly everywhere. Sledging is better. 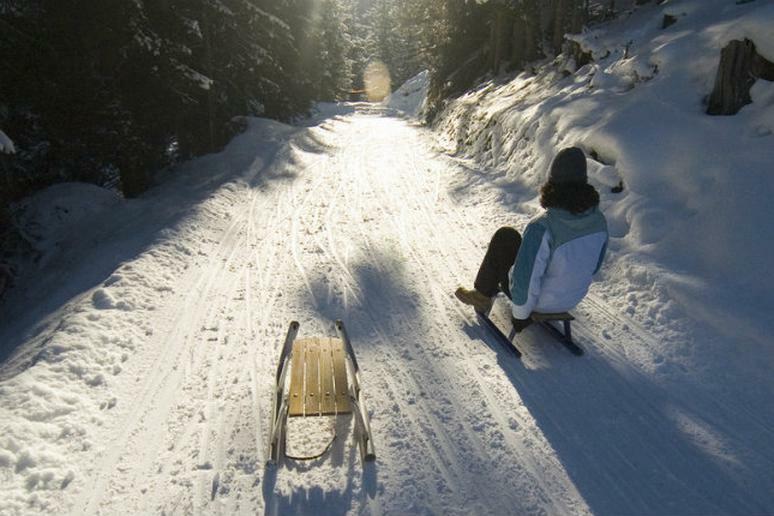 For starters, sledging in Switzerland usually requires some form of motorized transport—not to the top of some dinky local knoll, but to the lofty heights of a real, honest-to-God mountain. Expect to board a gondola, (or tram, train, etc.) that takes you to the top, where you embark on a gravity-powered, kilometers-long slide. From the top of the run, take a second and gaze out at the undoubtedly spectacular view, and steel yourself for the coming ride. Take a seat on your traditional wooden sled (or a modernized plastic version), grab onto your lead rope with one hand, grasp the rear of the seat deck with the other, put your feet on the runners, give yourself a shove and you’re off. To steer, lightly drop one of your heels into the snow, gently turning your sledge. If you happen to dig your boot a little too hard… well, you might end up splayed across the run with a face full of snow (I know I did). In this case, try to keep a death grip on your lead rope—it will keep your sledge from finishing the run sans rider. If you have the option, try sledging at night. If you can really plan, aim for a full moon. It’s indescribable to slip through the contrasting packed white snow and black moon shadows of trees, the chilly wind blowing across your face. As a bonus (with typical Swiss efficiency), your run might end at the door of a warm little chalet restaurant, complete with bottles of red wine and warm fondue at the ready. Your turn: Sledging opportunities abound throughout Switzerland, especially at select mountain ski resorts. For night sledging in Interlaken with a fondue finish, contact the experienced guides at Outdoor Interlaken.